By mid-February, everyone is tired of the bleak winter weather and pining for spring and warmer weather. A visit to Okamoto Bairin (岡本梅林) to view the plum blossoms is guaranteed to lift your spirits and give you the energy to see out the winter. They are in bloom from approximately mid-February to early March. The origin of the plum glove in Okamoto is unknown, but the old names for the Okamoto 6-chome and 7-chome neighbourhoods were Bairin (梅林: plum grove) and Umegaya (梅ヶ谷: plum valley). Toyotomi Hideyoshi (1537-1598), who unified Japan, is said to have relaxed at Okamoto Bairin. 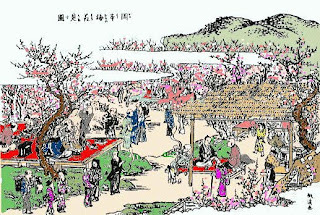 References were made to flower viewing in Okamoto in various books printed in the Edo period, including the plate shown above from the Illustrated Famous Locations in Settsu (摂津名所図会). The head of the Amagasaki Clan, which held control of the Okamoto area at the time, would visit with a large number of samurai every year when the flowers were in bloom. During the Meiji Era, the trains passing two kilometres south of the grove on what is now the JR line would briefly stop below the grove to allow the passengers to enjoy the view of the plums. Alas, all three locations mentioned here have disappeared. Landslides buried most of the Okamoto plum grove during the Great Hanshin Floods of 1938. What remained was destroyed by air bombing during WWII. The original location is now an apartment complex, which is soon to be rebuilt into a luxury apartment complex. The stables of Ikuta Shrine that were famous for cherry blossoms are now Ikuta Road. And, the levee of Minato River is now Shinkaichi Road. Okamoto Bairin—at its current location in Okamoto 6-chome—was opened as Okamoto Park (岡本公園) through the efforts of locals in 1982 with a total of 130 trees of 26 varieties of plums, a pagoda and a pond. Plans to expand the park to the east in the near future are under consideration. For those who have still not had their fill of plum blossoms, a walk up and across Tenjo River (天上川), then follow the path up Mt Hokura (保久良山) to enjoy the yamamomo variety of plum blossoms in the shrine grounds, which are said to be over 100 years old. As you approach Hokura Shrine (保久良神社) from the west, you will find another plum grove which opened in 1975. Just behind the plum grove are a few picnic benches for you to enjoy your bento or just take a break. Beware, though, of the wild boars. They are attracted to the sound of plastic bags thinking they contain food, which in your case they most probably do. Make no sudden moves. Ignore them, and they’ll ignore you. Even though the entrance to the shrine offers a stunning view of Higashinada Ward across Osaka Bay to Wakayama and Kansai Airport in the winter months, an even more spectacular view of the Hanshin area awaits the energetic all year round about ten minutes up the trail from the picnic area. You can return via Tenjo River, or take the eastern (main) approach to the shrine and turn right before or after you cross the Hankyu train line to return to the Settsumotoyama/Okamoto area (approximately 30 mins). 20 minutes walk from JR Settsumotoyama Stn, 15 minutes from Hankyu Okamoto Stn. From the main Okamoto shopping area, follow the pink banners to the west, cross Tenjo River and follow it north. If you reach Yahata Shrine (八幡神社), you have gone too far. Go back one block and turn right. Or just follow everyone else. being cay_anchor on Twitter and finding this blog post almost too painful to read for a displaced Kobeite, what can I say. It is an A#1 blog so far! More information to hand. Until March 14th, 2010, there is a free courtesy bus between Okamoto and Arima! The bus leaves Okamoto from the bus stop in front of the Mitsui-Sumitomo Bank on Yamatekansen (slightly to the west of Starbucks, which is north of JR Settsumotoyama Stn). You will need to book ahead on 078-436-1500.